An intermittent surface-to-air radar aiming system can make air defenses far more lethal on the modern battlefield. Radar jamming aircraft and radar-seeking missiles now make most medium to high-level anti-aircraft systems ineffective since the radar signal is jammed or the radar destroyed by an anti-radiation missile while it guides a missile to a target. The solution is CLAWS, (below) which fires the 335 lb AMRAAM air-to-air missile that has internal radar to hit aircraft up to 20 miles away. CLAWS can also fire the infrared guided 185 lb Sidewinder. However, since it has a range of just 10 miles, the Sidewinder's guidance system should be fitted to the larger AMRAAM missile. Acoustic missiles can present a triple threat. The drawback of these systems is they must be visually aimed, which is difficult at night or in bad weather. Modern infrared sights help overcome this problem. Nevertheless, the operator must guess the range, direction, and speed of an aircraft to aim his missile so it flies close enough for the missile's internal guidance to detect the target and "lock-on" for a kill. The solution is a small radar to aim self-guided missiles at the target aircraft. When aircraft are detected by human spotters or infrared devices, the small radar is switched on and quickly determines the range, speed, and direction of the aircraft for a computer that aims the self-guided missiles on an automatic turret to intercept, fires two missiles, and shuts down. Since the radar will emit for just a few seconds, it will prove difficult to jam or destroy. The operator may drive away to evade incoming radar seeking missiles. The radar system should have dozens of frequency options the operator can choose from to avoid jamming. In cases where jamming cannot be overcome, or the crew wishes to avoid sending out radar signals that may alert the target aircraft or attract unwanted attention, they can attempt to aim the missiles visually. LIDAR (laser radar) is another passive option. Acoustic missiles are valuable when visual aiming/guessing is required to target large high-flying aircraft since they easily acquire sound waves if aimed behind the target. A battery of SARASs would prove deadly as they develop a timing pattern to cover a large area. Each system could turn on its radar for 20 seconds in turn, then drive 100 meters away. Aircraft crews would become confused by the changing frequencies and direction of radar signals. Aircraft can avoid this threat by flying low or continually maneuvering at higher altitude to exploit the gap between the firing of the missile and the lock-on by the missile's seeker. However, flying low is dangerous due to terrain and simple AAA systems, and continually maneuvering at higher altitudes burns fuel and reduces range. It would probably prove too difficult for large aircraft like bombers and transports to maneuver fast enough, especially if they must align themselves for payload delivery. Ericsson sells a system like this on the world market. 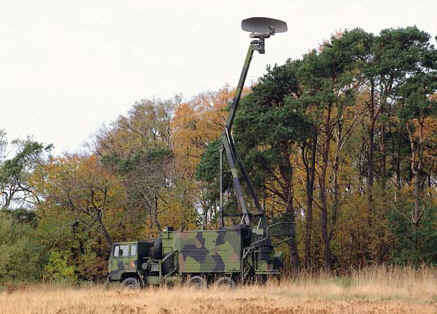 The Swedes employ another advance called the Giraffe radar. (right) This allows radar greater range and the ability to hide among foliage. In addition, this makes it difficult for an anti-radar missile to destroy the target as the radar dish is far above the radar system. A successful anti-radar missile strike would blow a hole in the dish while the radar system below escapes damage. A near miss causes no damage as the missile flies onward. 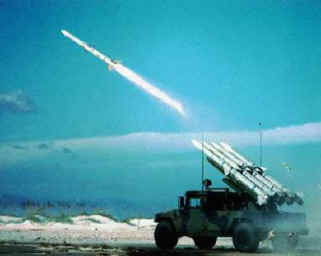 A "ducking giraffe" technique can completely foil anti-radar missiles. Radar systems today cannot avoid incoming anti-radiation missiles. They can shut down, but once an anti-radiation missile like HARM has a lock, it will fly into the position even if the radar signal is lost. However, a giraffe radar operator watching the incoming missile can duck the last few seconds by shutting down and dropping the radar dish several feet to allow the missile to fly overhead. He can then raise its "head" and continue operating after just a few seconds of downtime. A sophisticated SARAS could fire different types of missiles at different aim points by evaluating a maneuvering aircraft and anticipating course changes. In addition, anti-aircraft missiles should be programmed to fly an alternative intercept pattern if a target is not found at the projected range. The missiles fly in a search mode and lock-on to any aerial target since military aircraft normally operate in groups called "flights." If a battery of SARAS operate in the same area, an aircraft may find itself evading several missiles at once. The airpower gods may find their match with SARAS unless they adapt. They can use SIGINT to triangulate radar positions, even after just a brief transmission, and target that coordinate. This is more complex than just firing anti-radiation missiles, but will prove an effective tactic unless the radar system moves after each short scan.